WordPress 404 – File or directory not found, broken Images, multisite image path error. Resolving WordPress 404 errors – File or directory not found, broken Images in WordPress, and multisite image path error. We created these notes because of WordPress 404 errors when setting up our site on Microsoft IIS - File or directory not found, broken Images in WordPress, multisite image path error and the amount of work we put in on this issue and we are hoping this will help others who are setting up a new WordPress website on IIS. We are also running WPLMS as our current WordPress theme. Which is a large enterprise premium Learning Management System for WordPress by http://vibethemes.com. 3. 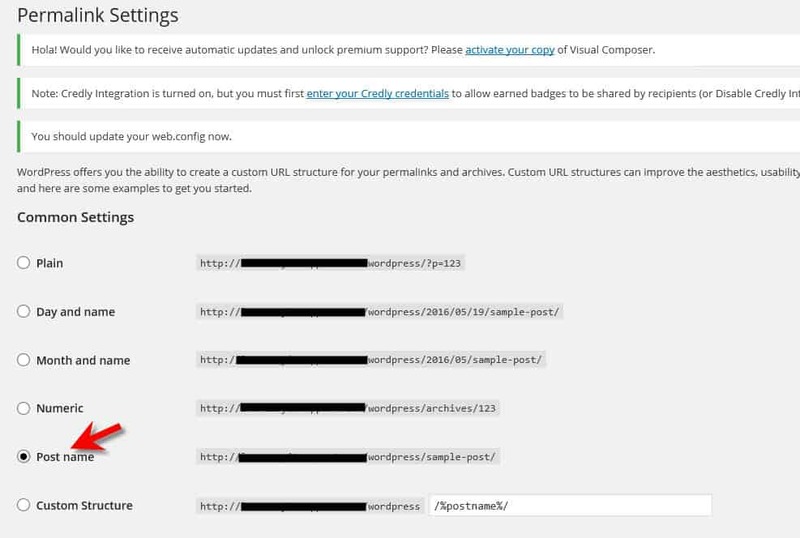 Installing and Configuring WordPress to work on IIS. 5. HTTP 404.0 when opening a page in WordPress. 6. 404 - File or directory not found. The resource you are looking for might have been removed, had its name changed, or is temporarily unavailable. First we will look at the 404 - File or directory not found error when any sub-page is opened on the site. 404 - File or directory not found and image path error. Below were the errors we were getting on a new setup and install of WordPress and WPLMS. Note: This could more than likely fix other issues with WordPress and other themes. This is not necessarily related to WPLMS Theme but more of an issue with our WordPress install and set up on Windows Server 2012 R2. Not all the pages may work yet. Keep checking to see if some work and others don't. You may also want to switch back to a default WordPress themes such as Twenty Fifteen. If some pages are now working and others don't try adding the following next. Or, if none of the sub-pages are displaying yet and you're still getting the 404.0 Error try the following too! Note: Don't worries if the images aren't working yet. We will get to that soon! IF not see below Web Platform Installer. In IIS makes sure URL Rewrite is installed. It was installed in our default install of IIS. If not, see below. Is the Web Platform Installer? 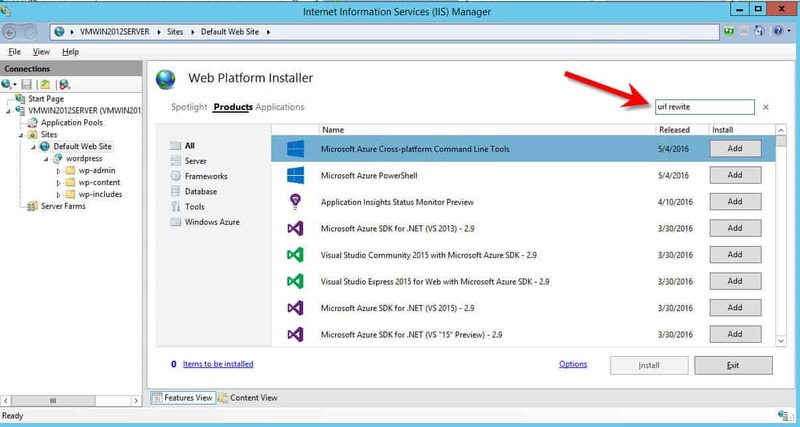 If the Web Platform Installer is not installed you need to add it to install the URL rewrite (yep, install it too; https://www.microsoft.com/web/downloads/platform.aspx. Don't worry its a very simple install). Simply do a search for the installer (URL Rewrite) and Add it to IIS. Do not configure it. We will get some things added to it later. Add the below text to Web.Config where your site is configured: (e.g. ..wwwrootwordpressWeb.Config). 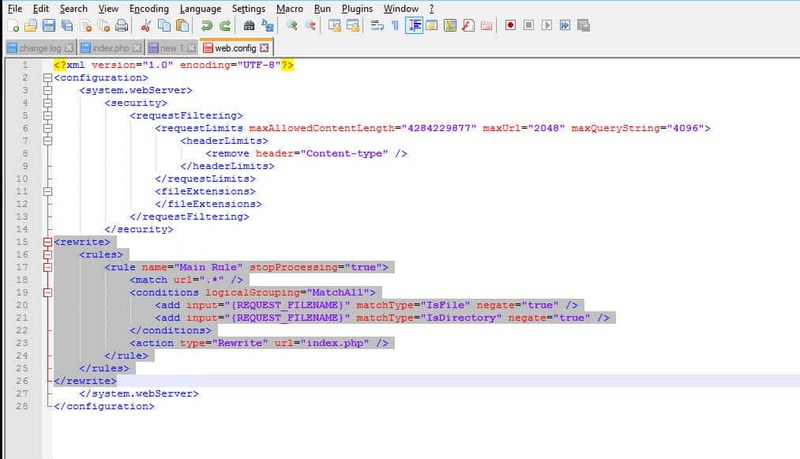 Open the Web.config file that is located in the same directory where the WordPress files are installed, and paste the below XML section into the system.webServer element. This rule will try to match any requested URL. If the URL does not correspond to a file or a folder on the file system, it will rewrite the URL to the Index.php file. At that point, WordPress will determine which content to serve based on the REQUEST_URI server variable that contains the original URL before it was modified by this rule. Save the file. Reopen it and make sure the changes have been applied. Restart IIS. After adding the above rewrite code to the Web.Config file you will see this in IIS URL Rewrite. 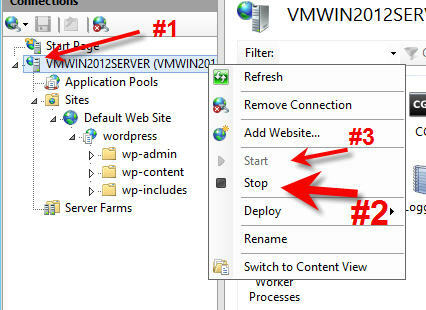 Make sure you have your website folder highlighted and not another location in IIS (e.g /wordpress). There should not be a need to add anything else. When we when back into IIS and looked at Match setting it look to be different then what we pasted in the Web.Config file. This is what it should look like for both REQUEST_FILENAME. Note: We tested this and when we set it to "Is a File" and Is a Directory" it broke the pages again. So, leave it set as the screenshot shows. Now you can try to test the site and see if it works, but we are not done. We changed our Permalink Setting back to Post name because our install of WPLMS highly suggested that this be set this way. We could not tell if that broke anything leaving it to Custom Structure or not. You may be OK leaving it. We did NOT and we switched it to Post name. Finally, new images we added to a WordPress page don't seen to be displaying even though they are in the Media Library. Add this to the root folder .htaccess file. Restart IIS. (Getting Images to display in WordPress). Note: by default WordPress does not create a .htaccess file. 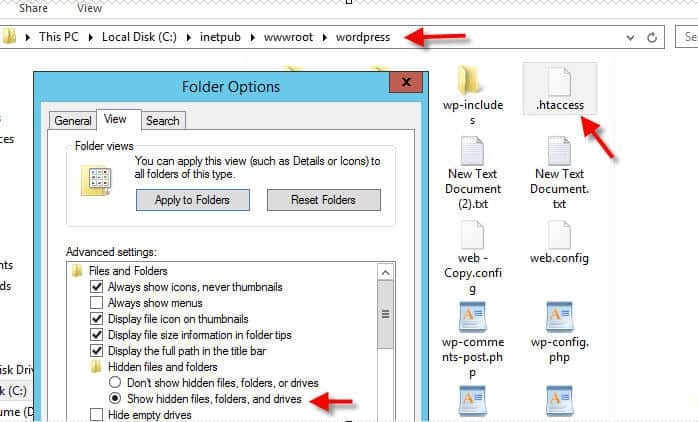 Simply create this file using word in the root folder of your WordPress site. Make sure it has the dot (.) in front of the file. See the screenshot below. Add the below to the .htacess file. Stop and Start IIS. Finally, set the correct file permissions on the site (e.g. /WordPress) folder for the IIS_USER. Open Explore and set the file permissions. Goodluck! If you need additional help with WordPress you can contact us at www.EasyITSupport.com. If your still having issues here are a few more thinks to look at. 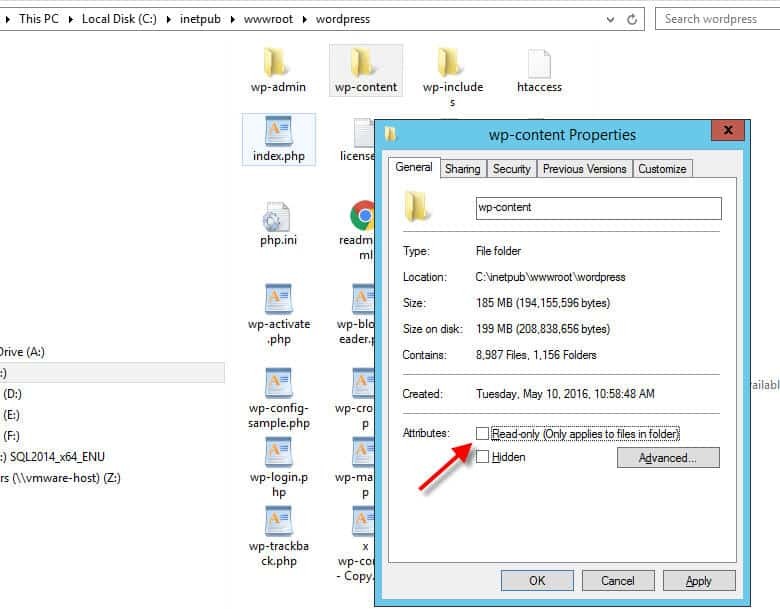 Setting permission on wp-content folder. 1. 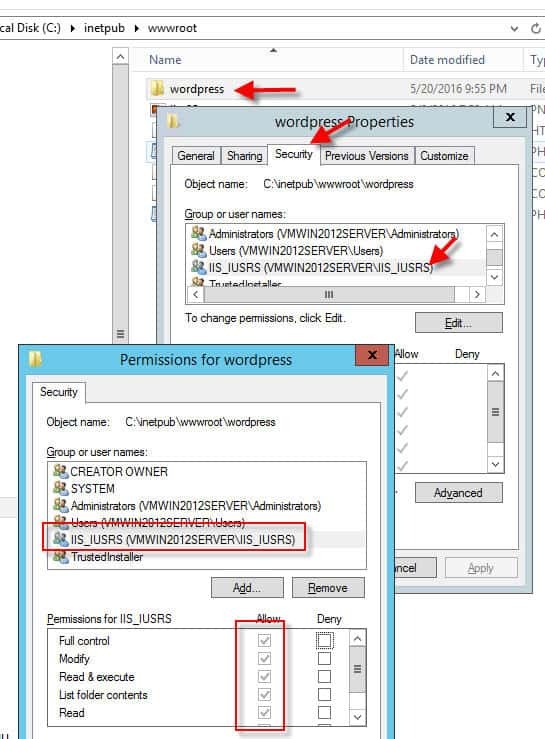 Change the permissions on the temp folder giving IIS_IUSRS write/modify. 2. Change the path of the temp folder in the PHP.ini file to a folder that does have IIS_IUSRS write/modify permission. I chose to move the temp folder in my PHP.ini to C:inetpubtempuploads and also give it permissions. After uploading an image in wp-admin, I was able to access the image (original, not resized) from a browser wihout the 500.50 error.